Partnership for Drug-Free Kids has a number of additional resources about The Teen Brain – Why Do Teens Act This Way? Straight Forward: The Truth About Addiction is a WisconsinEye documentary about opioid addiction and recovery in Wisconsin. Every path to addiction and every path to recovery is different and there is hope. This documentary tells the story of several young Wisconsinites through their honest, in-depth interviews about getting started, hitting rock bottom and their journey through recovery. Produced by Anthony Wood, director from Smoking Monkey Media and Skye Tikkanen, counselor at Connections Counseling, this 50-minute documentary also features parents of children living with addiction and a child whose mother died of an overdose. The goal is to have the documentary screened in every middle school and high school in the state. Lesson plans are also available for classroom use, free of charge. Teen Drug Abuse Statistics and Facts – From the Recovery Village, this site explains common drugs used by teens, what they do to the developing brain, behavioral signs of drug use, and how to determine if professional help is needed. This would be a fantastic resource for parents who suspect that their kids are using drugs. Public Health Surveillance and Alcohol-Related Injuries – An infographic created by University of Illinois at Chicago’s Online Master of Science in Health Informatics degree program. Know – Talking to your child about alcohol, tobacco and drug will help them make good choices, but you may not be sure what to say or how to say it. Sign up for Know! to receive emails twice a month. Know! gives parents and caregivers the education, strategies, and empowerment they need to raise children who are healthy as well as alcohol, tobacco and drug-free. A Substance Abuse Guide for Parents – In order to prevent kids from abusing drugs or help them recover from addiction, parents should understand drug addiction and the effects it has on teens. DrugRehab.com has put together this resource for parents. Talk. They Hear You. 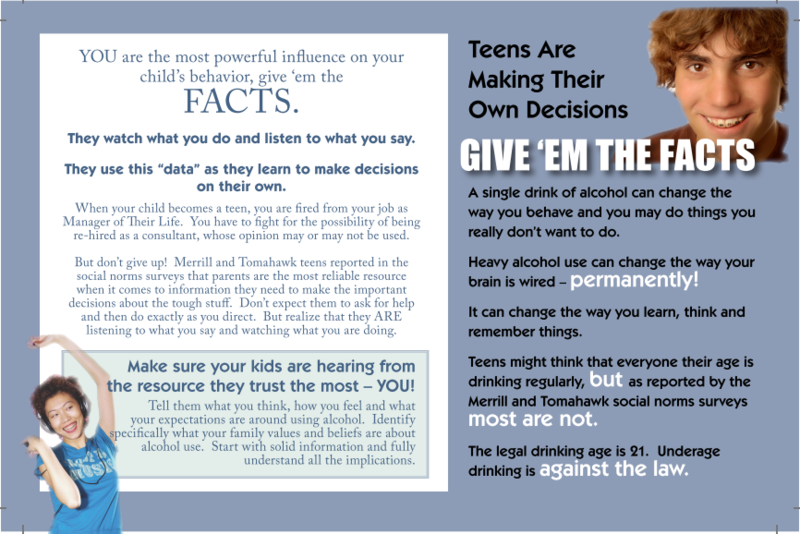 – SAMHSA’s underage drinking prevention campaign helps parents and caregivers start talking to their children early—as early as 9 years old—about the dangers of alcohol. The SR22 Insurance website (scroll down the page) provides a library of resources aimed at keeping teens safe on the road including guidance on underage drinking, distracted driving and drugged driving. Looking for help with alcohol and other substance use/abuse? Addiction Center – Addiction Center is not a specific treatment facility, instead we are a free web information guide that connects addicts and their families with the help they need to put their lives together. Prescription pain medications are some of the most prescribed drugs in America, inviting the highest levels of addiction due to both their potentially euphoric nature and quick development of dependency. There are an estimated 4.7 million people dependent on painkillers nationwide. Addiction Center’s goal is to help these individuals and loved ones by providing them with information and support on different prevention strategies, abuse, and recovery support. Addiction Resource – Their goal is to make helpful and verifiable information available on substance abuse and addiction rehab and recovery as well as direct you to the best sources of help, including The Substance Abuse and Mental Health Services Administration (SAMHSA) at the U.S. Department of Health and Human Services. DrugRehab.com – Their mission is to equip patients and families with the best information, resources and tools to overcome addiction and pursue lifelong recovery. Drug Rehab Connections – Founded by a group of individuals who know both sides of addiction, their goal is to serve as a starting point to finding individuals and families help that are battling addiction. ProjectKnow – This website contains resources to help people understand addiction and treatment. RehabSpot.com – This website is a resource created to educate its visitors on addictions and addictive substances and to provide internet users with information to aid in determining if they or a loved one have a substance abuse issue. This website was also created to assist the loved ones of an addict as well as the addict themselves in finding the best treatment fit for their specific needs. RehabSpot.com is owned by Recovery Worldwide, LLC, a for-profit organization that specializes in creating health-related educational web projects. All funding and financial sponsorship for RehabSpot.com comes from Recovery Worldwide, LLC. “Parenthetical” – To learn more about issues affecting teens and preteens, consider joining the “Parenthetical” online community. “Parenthetical” features weekly articles about parenting topics based on research and the collected lessons and wisdom of parents. 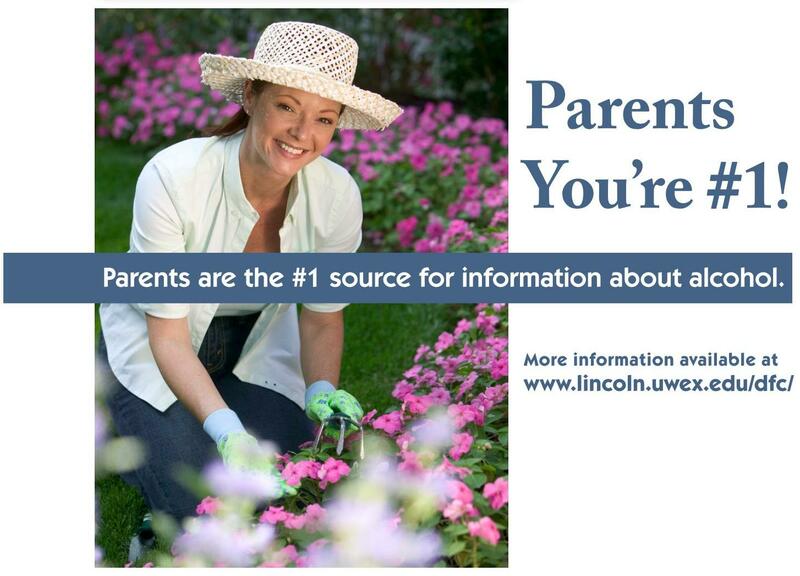 Parent Support Network of Lincoln County – Mission of this network is to promote the health and safety of families through leadership, referrals and education. Keep up to date by visiting the network’s website and subscribe for information to be sent to you in ONE weekly digest of information released. October is Medicine Abuse Awareness Month – So let’s get talking! (even when taken by the intended user). Those who use medicine to get “high” are obvious abusers. But what about those who use for other reasons, like; relieving pain, improving grades, to remain alert, fall asleep, or to lose weight, what if they are attempting to alleviate anxiety or depression? No matter how “good” of a reason it appears to be, if a prescribed medicine is being used by an unintended person, or in an alternate manner, dosage or time period, it is considered medicine abuse. So you’ve got the conversation started with your child about medicine abuse; we’ll help you keep it going in our next tip – Know! October is Medicine Abuse Awareness Month – So let’s keep talking! (Part II). In it we will discuss the many health-related dangers, as well as associated legal consequences, to prevent use. Visit Know! Medicine Abuse Awareness for more information. In the 2012 Tomahawk High School (THS) and Tomahawk Middle School (TMS) Social Norms Parent surveys, 100% of TMS and 97% of THS parents don’t approve of parents who allow other people’s children to drink alcohol in their homes …even with supervision. For Merrill High School (MHS) Parents, 97% don’t approve of parents who allow other people’s children to drink alcohol in their homes …even with supervision. (Source: 2012 MHS Social Norms Parent Survey). Hosting a party where alcohol is available to underage youth is illegal and can pose serious health risks and legal ramifications for everyone involved. Parents should not be misled by the plea: “But other parents let their kids do it”. Adults providing alcohol to underage youth sends a mixed message and can only add to a teenager’s confusion about the acceptability of drinking. They are also sending the message to teens that they do not have to obey the law. Research shows that most teenagers appreciate it when their parents set boundaries and establish expectations that are fairly enforced. According to Wisconsin laws, parents who knowingly allow a person under age 21 to remain on their property while consuming or possessing alcoholic beverages can be prosecuted and face jail sentencing, fines and/or loss of property. 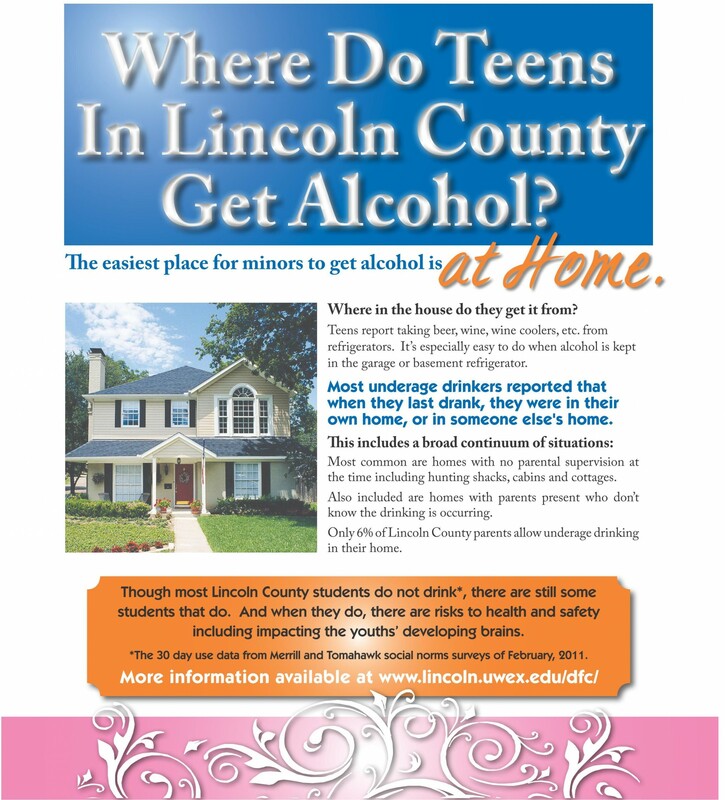 Lincoln County Drug-Free Coalition is continuing the “Parents Who Host, Lose The Most: Don’t be a party to teenage drinking” public awareness campaign to inform parents about the dangers of teenage drinking parties. 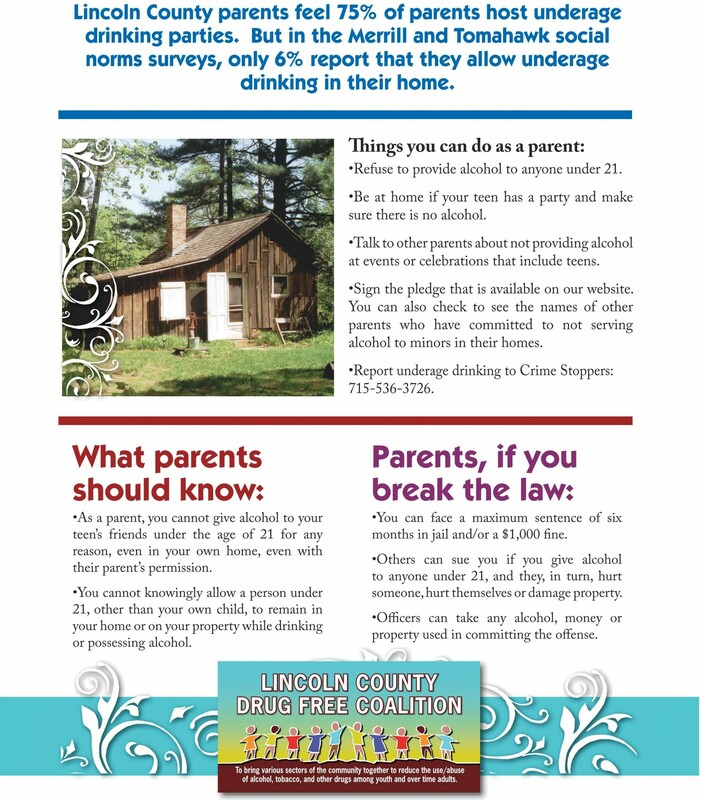 The goal of the campaign is to inform parents and other adults about the legal ramifications and health and safety risks of serving alcohol, or allowing drinking by teens.